The people at EaseUS contacted me commenting about this new software they released, its called MobiSaver and they claim I was going to be able to recover almost any item from my iOS devices, and all for FREE. I know EaseUS since some years ago and I know they have very nice file recovery products, so I decided to check it out. 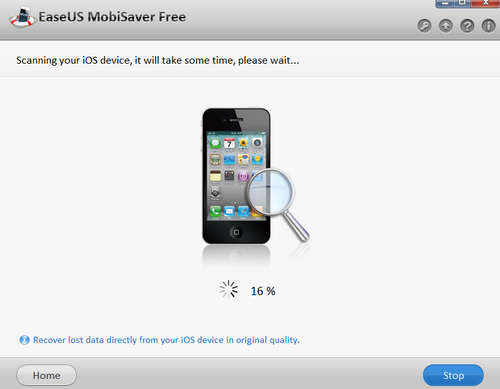 As you can see on EaseUS website, the software claims to be the “World’s first FREE iPhone, iPad & iPod touch data recovery software for home user”. You can recover: lost SMS, Contacts, Call history, Notes, Calendar, Reminders, Photos and Videos etc. directly from iPhone 5/4S/4/3GS, iPad 2/1 and iPod touch 4. 1) I created a note called “Test for EaseUS” on my iPhone 4S and then I deleted it. 2) Then I downloaded MobiSaver, installed it on my Windows 7 PC and followed the in program instructions. The home screen of the application asks you what type of item you need to recover. (Contacts/contact records, Photos/Videos, Reminders/Notes). 3) I selected Notes and then I was asked to connect my iPhone (a 4S) and I did (just make sure you unlock it before). Recovering of deleted pictures directly from the iPhone still has some problems, but the support team assured me they are working on fixing this. You can still recover pictures from an iTunes backup, but I didn’t try this. I think this would be one of the most used cases. I always see a lot of programs claiming to do this, and they all cost something, MobiSaver is free for personal use, and proved to have worked very well with a very simple & easy to use interface. Of course will be even greater when support to directly recover deleted pictures from our devices is added soon, so keep a look at their website for new releases. I can already see several IT guys recovering the CEO´s iPhone pictures with the new version and become “magicians” in their companies :P.
On the meantime all the rest of the items can be recovered so its a helpful to have this tool handy. Once SMS messages are recovered using esaeus mobisaver can you restore the conversation to your iPhone or just save it as a text file?